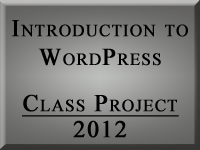 The following articles are for Lorelle’s introduction to WordPress classes. Currently, they are featured as full credit classes at Clark College in Vancouver, Washington. For more information, please contact Lorelle or the college directly. We live in a world of ever changing terms and jargon. Let’s see if this will add to the confusion or clear things up when it comes to what to call a blog and what to call a website. A website, or site, is a collection of web pages. A site is designated by its domain name, the part of the address or URL that defines the site such as WordPress.com, WordPress.org, or lorelle.wordpress.com. A web page is any page on the web, usually found within a website. A web page address is an extension of the domain name that points to the web page location on the site, such as example.com/article-title or example.com/2014/03/21/article-title/. A blog is a site with content displayed in reverse chronological order. These are the facts. A site can be a blog and a blog is a site.